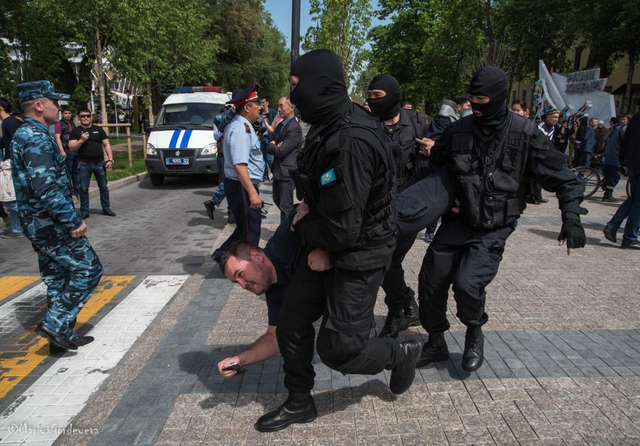 Yesterday on the 10th of May a few hundred of people in Almaty, Astana, Uralsk and Shymkent went out to protest against the use of torture and political imprisonment by the government of Kazakhstan. People gathered in squares and outside city administration buildings holding signs saying “No Torture”. The protests appear to be organized by by the foreign-based opposition leader Mukhtar Ablyazov and his party "Democratic Choice of Kazakhstan". Both Ablyazov and hist party were declared "extremist" and are prosecuted by the government. The Kazakhstan's government is known to be very fierce in its oppression of political activism. The amount of people present at yesterday's demonstration were hardly a significant portion of Kazakhstan's 17 million population. Nevertheless the Kazakh government decided to strike with full force against the tiny group of peaceful protesters, including the use of masked riot police. It has been reported that at least 50 people have been detained.